at a tourist attraction or screeched to a grinding halt? 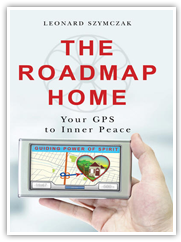 Author and psychotherapist Leonard Szymczak invites you to plug into your inner GPS and find your way “Home.” He draws upon his personal challenges and professional experience to map out a route of conscious living and steer you through the stages of spiritual awakening. In that process he shows you how to connect with the ever-present GPS, Guiding Power of Spirit, which illuminates the road to love and inner peace. 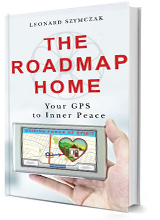 The Roadmap Home: Your GPS to Inner Peace is an intelligent and highly accessible book that blends practical psychology with heart-opening spirituality. If you are ready to heal on all levels, read this book. — Jon Mundy, Ph.D., lecturer and author of What Is Mysticism? — Rev. Sandy Moore, Inspirit Center for Spiritual Living Orange County, author of The Green Intention: Living in Sustainable Joy. — Rev. 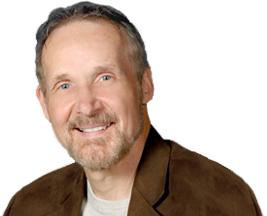 Kirk Moore, Inspirit Center for Spiritual Living Orange County, author of Tara’s Angels.